In May last year I bought a bottle of Estée Lauder's Bronze Goddess having been completely won over by its summery opulence and smouldering appeal. Despite the name, this is one skinscent that deserves to be enjoyed by women and men alike. Much like the swanky advertising graphic suggests, Lauder succeeded in capturing incandescent warmth and solar radience in this bottle... it is the epitome of summer glam, to me. 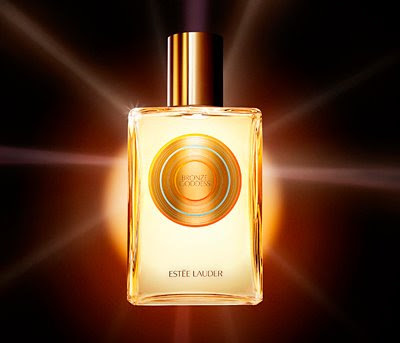 Originally released as a summer limited edition as the followup to Tom Ford's collaborative effort with Lauder on their Azzure Oil in 2006 and Azzure Soleil fragrance in 2007; Bronze Goddess now appears to be a mainstay in the Lauder lineup. This finite release saw stocks all but gone by the end of summer '08, but today major retailers appear fully stocked again for summer 2009. And I can certainly understand the reason for resurrecting this amazing eau fraîche skinscent for a second year running. Bronze Goddess is shimmering with sun-kissed mandarin and bergamot, and brimming with exotic jasmine, magnolia and orange flower... notes typical of summer in the tropics. But there is a wonderful honeyed, "chewy" gourmand quality to the scent too... its opening burst reminding me of Ford's triumphant Black Orchid. There is a delicious toasted coconut accord and lactic milk vibe that renders this perfume absolutely addictive. One might easily visualise tanned bodies smattered with fragrant oils reaching for chilled pina coladas or jewel-encrusted cellphones offered to them by cabana boys on silver trays. Bronze Goddess is about pool-side glamour and summer evenings of decadence and excess on the French Riviera. Unfortunately for me, whilst I don my swimming trunks and bare my white flesh to the skies for the first time this season (watching neighbours recoil in horror from their windows like hissing vampires burned by the sun), I am reminded again that I am a million miles away from the Côte d'Azur. The silver lining is that with a spritz of Goddess, I can close my eyes and feel - at least for a time - like a Hollywood "A"-lister. Love the ice cream / coconut pic D - made me hungry. Have you compared Azuree Soleil Eau Fraiche and Bronze Goddess side-by-side? I own ASEF and I'd love to know if Lauder kept the same formula or tweaked it in BG? Actually no, I haven't. Perhaps you and I should organise a sample swap of these two scents and then compare some notes. Come from Creta-Greece for summer!!! I love Bronze Goddess, I feel like one by just using it. Great photos and well described. I'd love to compare it to the new Guerlain Terracotta Sous Le Vent also...which seems to **sound** a lot like the Lauder's also, but perhaps a little more floral. Bronze Goddess is so sumptuous and opulent: so generous ! I finally caved in and bought Bronze Goddess this spring, having reached for a spritz of the tester every time I passed an Estee Lauder counter for the last 2 years. I only regret not caving sooner, when I could have bought the Azuree Soleil, though to be honest, they aren't that different. I imagine they had to alter the recipe enough that Tom Ford didn't sue them. I expected the coconut top to follow me around all day, so I've been pleasantly surprised to find that it fades after an hour or so, into a very nice woody skin musk sort of thing that is immensely wearable. Lauder is just so good at these scents that have massive appeal. And it's wonderful that they keep their back catalogue going, too.